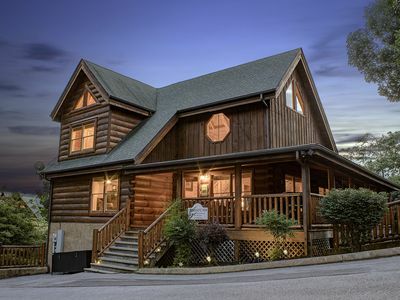 "Mama Bear" is a beautiful single level all wood cabin with 2 Master Suites. 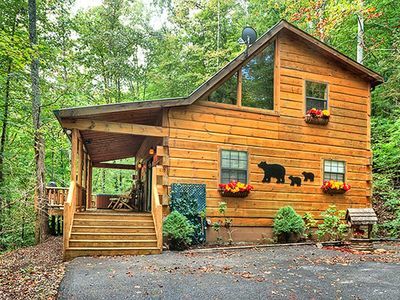 “Mama Bear” is a beautiful, single level, all wood cabin that offers 2 charming Master suites. 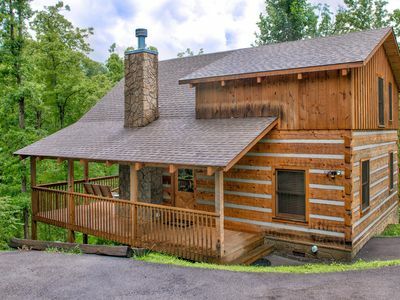 This 2 bedroom, 2 bathroom cabin that sleeps 8 is only minutes from the Parkway in Pigeon Forge and sits on well over an acre of land. 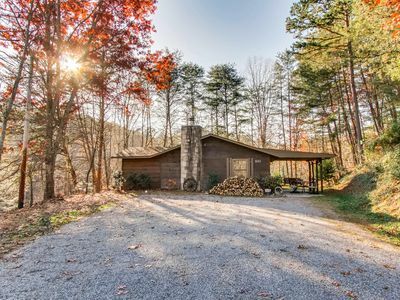 It has a generous yard that is surrounded by large trees providing complete privacy. The road to the cabin is completely paved and while it is considered motorcycle friendly at the riders’ discretion, it is not considered trailer friendly. 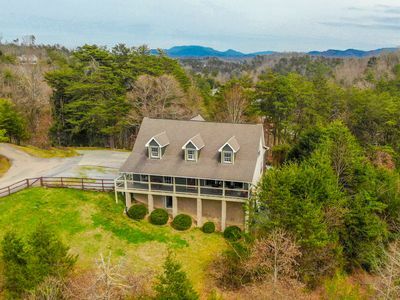 A long, paved driveway with an incline welcomes you to the top of the property, where there is level parking available for up to 2 vehicles. 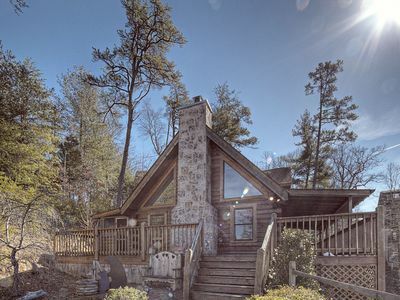 There are no steps to enter this cabin. 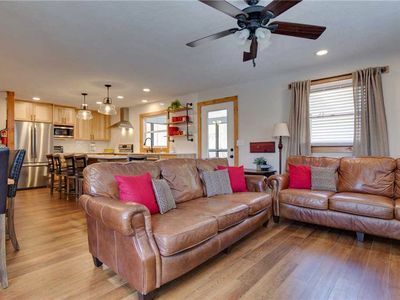 You will be pleasantly surprised when you discover the beautiful wood interior, a wall full of windows, and an incredibly spacious floor plan. 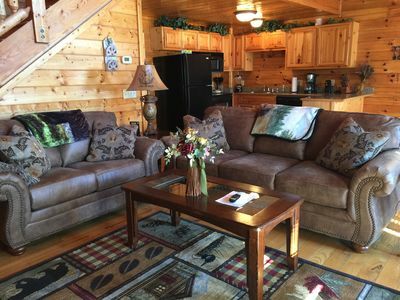 The cabin offers a fully equipped kitchen and a dining table that will comfortably seat up to 8 people. 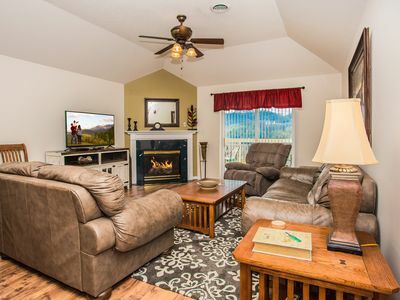 Adjacent to the dining area you will find the living room that has 2 comfortable couches (one of which is a Queen sofa sleeper), a floor to ceiling stone gas fireplace, and a 55 inch flat screen TV with cable, wi-fi, and a DVD player. The game room sports a pool table, a small bar with stools, and a full size futon to watch the TV above the fireplace. The first Master suite welcomes you with a King size bed, a 32 inch flat screen TV, a large jacuzzi tub, and a separate walk in shower. There is an adjacent area to this suite with the washer and dryer. The second Master suite offers a Queen size bed, a 32 inch flat screen TV, a large jacuzzi tub and a separate walk in shower. 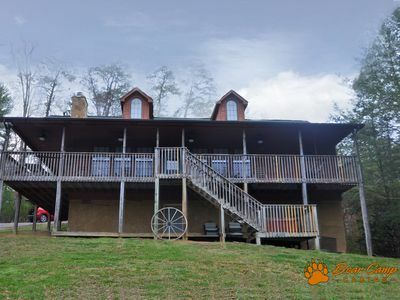 With 2 large covered decks and an assortment of outdoor furniture to please and accommodate everyone, “Mama Bear” encourages relaxation and family time both inside and out. 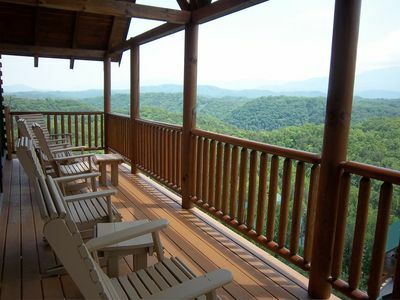 Enjoy a cup of coffee in one of the rocking chairs or watch the sunset over the mountains on the 2-person porch swing. 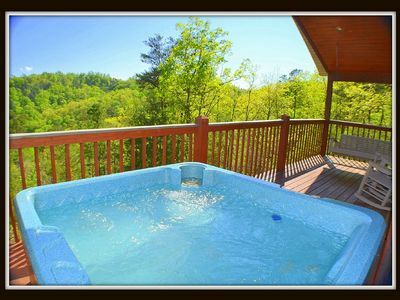 The lower covered deck houses the hot tub to soak away your day. 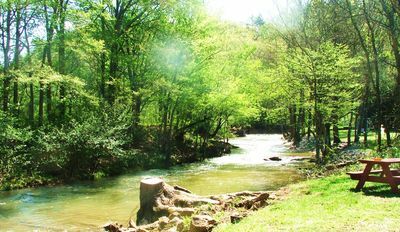 Gather around the picnic table and enjoy a fare of hamburgers hot off the charcoal grill, or simply enjoy a board game while listening to the sounds of a Great Horned Owl hooting to his mate under a magical moon. 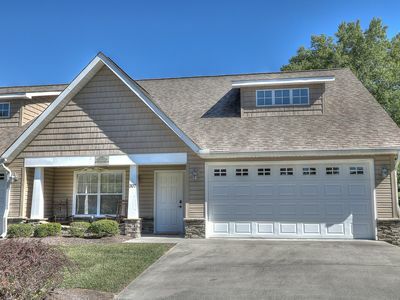 "Mama Bear" offers pool access and fishing pond access at Honeysuckle Meadows for those days you really just want to relax and let the kids play in the water or go fishing in the catch and release pond. 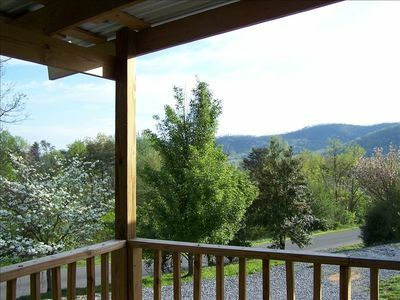 If you are looking for a great vacation cabin where you will find both tranquility as well as close proximity to the Parkway and all the area attractions, look no further than “Mama Bear”. 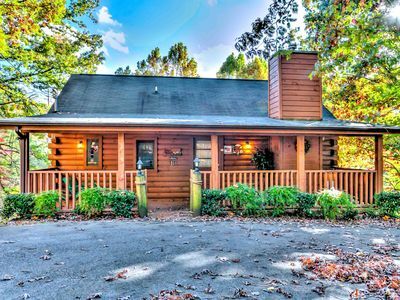 Don’t miss out, Book this cabin Today!!!! This cabin is NOT pet friendly. 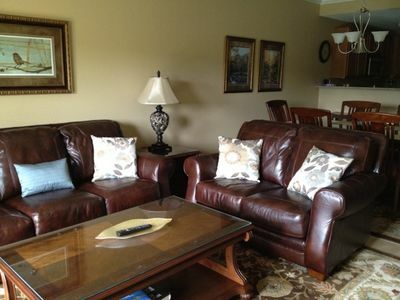 New Luxury Designer 3/2 Condo! Come Relax, Unwind and Enjoy!!! Detail Oriented? We are your Cabin! 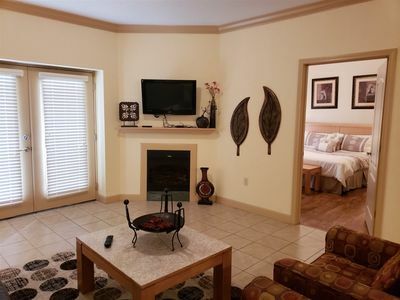 Outstanding Amenities, Will NOT Disappoint! 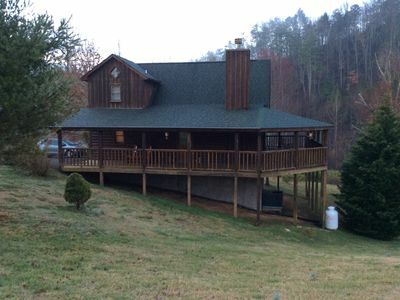 Dog-friendly mountain cabin offers great location, private hot tub, & much more! 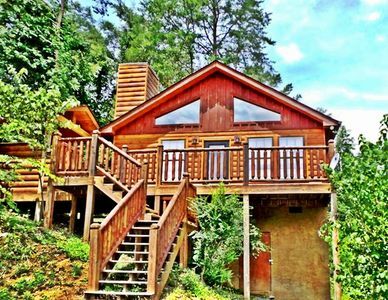 ER239- Sleepy Bear | Great Location – Close to town! 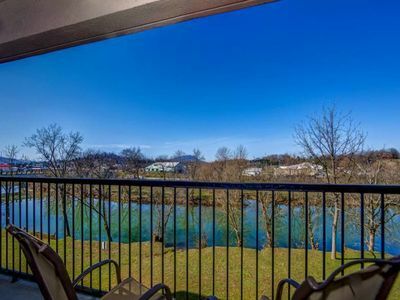 Riverfront condo w/ shared pool & hot tub - close to Pigeon Forge attractions!